What is DUSCIS and how does it serve the Smithsonian? Smithsonian Profiles, now available to the public, is a tool which highlights Smithsonian staff and scholarship. The system displays data from various sources, augmented by input from individuals, to showcase the depth and breadth of expertise at the Smithsonian. The intent of Smithsonian Profiles is to bridge connections beyond the Smithsonian -- with potential external collaborators, partners, and peers. A group of Smithsonian scholars and museum peers have come together to produce an issue of Curator: The Museum Journal exclusively focused on ivory. 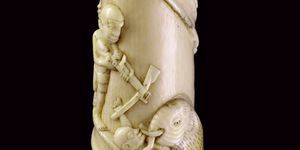 The double, open access issue discusses threatened African and Asian elephants but also highlights the role of historic ivory works of art and how museums might engage visitors on the topic of ivory.